Almost every year I’ve been doing a bike ride in Chichibu, a rural basin surrounded by mountains in the west of Saitama prefecture, to see the autumn leaves there, but I also enjoy it in other seasons. A week ago I had planned to head back there, but changed my plans due to the rainy Saturday forecast, as the rainy season was still not over. Since then the summer heat has invaded us with high humidity and temperatures of over 30 C every day. Instead of that Saturday ride I joined two friends on Monday for my first true summer ride this season. The temperature hit the high 30s. I drank plenty of water, but was still exhausted when I got home. In the latter part of the ride I passed Senzoku-ike, a lake in Tokyo that I had never visited before. I took pictures at a Shinto shrine (Senzoku-ike Benzaiten) on a small island accessible via a bridge. There were ajisai (hydrangeas) growing at the park and the bright red shrine looked relatively recently renovated. I enjoyed discovering a new spot I had not seen before. The following weekend my friend Jack, with whom I had ridden in Chichibu several times before, announced he would head back there for a some cycling with a friend, so I decided to join him. We initially wanted to do the old “Ghost Town Loop”, a ride past a deserted mining town, but then found out the road leading there was closed due to repair work on some tunnels. A phone call to the office in charge in Chichibu confirmed that the repairs would still take a couple more months. Our friend Mike suggested we might head to nearby Mistsumine shrine instead, which neither of us had been to before. On Saturday morning I loaded my Elephant NFE into my Prius and drove out to Chichibu. Unlike with my Bike Friday, I still don’t have a good way of taking my NFE on trains, due to its front rack and fixed fenders that don’t make for easy disassembly to get a smaller package that’s easier to carry on. After a 2 hour drive I parked the car in the parking lot of the Michi-no-Eki (Road Station), which has ample space and is not far from Seibu-Chichibu station, where Jack and his friend would arrive. After unloading the bike, changing into my SPD shoes and putting on my helmet, I filled up my water bottles at the tap of nearby public toilets. Next to the toilets there was a public fountain where people were filling up as many water containers as would fit into the back of their car. You see this kind of thing a lot. Even though tap water in most places in Japan is very good, some people swear by specific sources in the mountains and use the water from there for making tea or cooking soba noodles, for the very best taste. They will even drive there regularly, like every week. Next I stopped at a nearby convenience store to get some food and have a cup of coffee, as I was still early: I had left enough time, just in case the roads were congested but they hadn’t been. It was only the second time I had taken to the car to Chichibu for cycling and the first time on this particular route (via National Route 299 from near Hanno). Then I cycled the last km to the station and looked for Jack. He and his friend soon arrived. It turned out to be Kuba, who I had known online for years, but who now lives oversees. He had been a very strong cyclist in the past but recently he had not been riding much. Consequently we picked a very moderate pace, which suited all of us fine in this heat. It was a sunny day, with a forecast high of 34 C, but usually with the tarmac soaking up the sun the air temperatures above the road will be hotter than the forecast, unless the road happens to be shaded. We followed the familiar route west out of town towards the ghost town, avoiding the main road as much as possible in favour of small back roads. That made it easier to ride side by side and to talk. After about 24 km we got to the t-junction where a right turn used to take us to the ghost town and for the first time we turned left, unto an unknown road signposted for Mitsumine Shrine. At a shaded place up the road with one of the ubiquitous drinks vending machines we stopped and filled up our water bottles and talked for a while while we cooled off again. Soon we got to Futase dam and Chichibu lake behind it. After taking a few pictures we followed the road across the top of the dam and started climbing on the other side. It was a steady uphill, some of it quite exposed to the sun. We all climbed at our own pace but reassembled every now and then, to cool off in the shade together and talk. It was around 35 C and not even noon yet. There were quite a few cars and the odd bus heading up towards the shrine, which we knew was a major tourist attraction. The distance numbers on the road signs were getting smaller and finally the climb leveled off as we got close, now at about 1,000 m elevation, about 750 m above where we had started. The shrine was not visible from the road, only a big car park with cars, motorcycles and buses. We headed in there to use the toilets and to fill up our water bottles again. We discussed visiting the shrine, but Jack was also interested in visiting Gelateria Hana after we’d get back to Seibu-Chichibu station. On several rides to the ghost town he always made it back too late to still be able to do that. So we decided we’d give the shrine a miss and instead head on, to increase our chances of ice cream, pizza and espresso at Hana. There was almost no traffic on the road beyond the shrine (I had heard that side was closed to cars but saw no sign prohibiting entry to motor vehicles and we did actually encounter a handful of cars). After 2.5 km we reached a tunnel through the mountains at about 1150 m above sea level. The cool air inside felt so pleasant. We could almost have staid there, but then we wouldn’t have seen the views that awaited us… Such as the stunning panorama presenting itself after the tunnel exit! As we continued, there was a lot of sand on the road, perhaps still left over from the winter service. I proceeded very carefully until the road was clear again, as I didn’t want to wipe out in a corner. My companions got ahead of me but I knew they would wait for me somewhere. This side of the mountain was beautiful, very green and shaded. After a while the road joined a mountain stream which then merged into the wild Ochi river. We descended for over 10 km, giving up about 750 m of elevation. Climbing up this way would be scenic but hard. I’ll try a reverse loop one day! Eventually we crossed the Arakawa and rejoined the main road. Since it was almost all downhill from there to Chichibu, we could keep going pretty fast and didn’t take the same back roads. Still, Jack concluded that by the time we got back to the station, if he were to visit the ice cream shop before taking the train back, it wouldn’t leave enough time for their existing evening plans, so he dropped Gelateria Hana — again. Meanwhile, I was intrigued enough about it that when we finally made it to the station after 16 km in the sun on the main road, I told my friends that I’d give the cafe a try. Chichibu is famous for its many temples and shrines, which inspire both pilgrimages and shrine festivals (o-matsuri). I passed a shop displaying traditional masks used at shrine festivals. Route 11 to the cafe was easy to follow and flat until the last few km, but once it started climbing, it also entered the shade of the forest and the air felt pleasantly cool. Nice! Soon I arrived at the cafe, which is popular with cyclists. There was a bike rack in front. I got a table on the deck outside in the back with a view of the river. I tried some blend coffee with plain waffles and their chocolate-mint ice cream. It was a nice treat after the ride. His sympathy for my country’s team was a nice gesture, but to be honest I’m not actually interested in football. This is not as uncommon in Germany as the stereotypes would have you believe: According to consistent annual opinion poll results, of the German-speaking population aged 14 and over some 36% are “not particularly” or “not at all” interested in football, outnumbering both the less than 35% that are “especially” interested in it and the not quite 30% that are “also but not that much” interested. There you have it, only a minority of Germans has a strong interest in football and that’s whether their country’s team wins or loses! 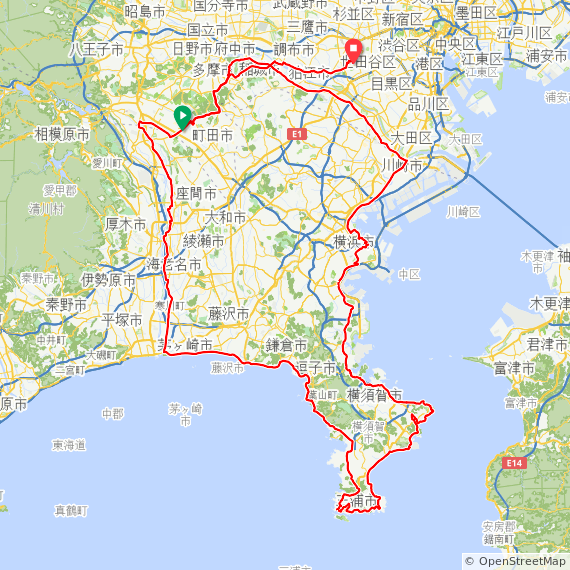 On Saturday/Sunday, May 12/13, 2018 I finished BRM512 (BRM512富士大回り400km), at 400 km my biggest brevet of the year. After having abandoned the 300 km BRM414 AJ NishiTokyo brevet around Mt Fuji due to atrocious weather conditions on April 14/15, 2018 (see report here), I had been a bit nervous about this one. It does an even bigger loop with more elevation gain (3500 m vs. 3000 m) and in my case, because I’m a slow cyclist, more time spent not sleeping. I love the splendid Fuji views and the great variety of scenery that AJ NishiTokyo’s 400 km brevet offers. It covers 4 prefectures (Tokyo, Kanagawa, Yamanashi and Shizuoka). In both years in which I had completed the 400 previously (2015 and 2016), I pre-rode it as a personal ride on my own two weeks before the event, which really helped to prepare myself (2015 and 2016 reports). On the day of this ride my father, who passed away from cancer about 5 years ago, would have turned 80. As a keen hiker, he would have appreciated the views and the camaraderie of this event. I was thinking of him a lot this day. The abandoned 300 km in April shook my self-confidence, since it was the first time I had abandoned a brevet on a course that I had successfully completed before, even if it was due to an external influence such as extreme weather. I then decided on a crash course to get into shape for the May ride, still doing only one long ride a week, but picking difficult ones. There are a couple of courses that I tend to ride only infrequently (such as once a year or less) because they’re so hard. One of those is the Oume Temple Loop, a mountainous course near Hanno conceived by my friend Deej. Most years I only rode it once, if at all, but then in 2017 I ended up doing it twice just one week apart, each time with a different friend. I really thought that exercise helped me on my subsequent Fuji 300 brevet, which I finished with a personal best time despite insanely hot temperatures. So for this year I put the Oume Temple Loop back on the menu. One week after the rained-out Fuji 300 I cycled to Oume to pick up six other people and we rode the course. One highlight is the Takayama climb, a big climb of 8 km that gets steeper and steeper and tops out at over 20%. You will pay for this effort on all subsequent climbs on the ride. The scenery is beautiful though. Many of the rindo (forest roads) are exceptionally quiet. It’s a world apart from Tokyo. Two days later I announced a repeat of the ride for the next weekend and was rejoined by one of the participants from the first time and three others. Again it was very hard. I don’t know if the memory of the previous ride helped or discouraged, but we did it. The next weekend I organised a ride up the Kazahari rindo, a forest road in Hinohara with up to 19% that has a reputation for being painfully steep, followed by a visit to the Nippara Limestone Cave. Altogether I did 5 rides of 178 km or more on the 5 weekends before BRM512. I think especially the Temple Loop rides were excellent training, both physically and mentally. In the week before the ride I tried to avoid staying up too late and took a nap on some days if I had got too little sleep for some reason. I also watched the weather forecasts for Saturday and Sunday for several locations around Mt Fuji, to make sure there was no chance of rain. The Monday before the brevet I took my Elephant Bikes NFE to Tim of GS Astuto to install new brake pads and check the rotors as I knew the pads were pretty worn out. It turned out the rear pads were actually worn down to the metal. With fresh resin pads the brakes are fantastic again. On Friday evening I loaded up the bike to cycle 29 km to Sagamihara, where I had booked a room for the night at Toyoko Inn, so I could get plenty of sleep and would only have to cycle 3 km to the start of the event. Despite having rested the whole week I didn’t feel particularly energetic on the way to the hotel, but it always depends on how you feel the day of the ride. A good night’s sleep can make a lot of difference. My alarm went off at 05:40 in the morning. I had gone to bed around 22:00 the night before, but woke up twice during the night. I took a quick shower, got dressed and picked up my things to check out. Soon I was on the road. 10 minutes later I arrived at the park for the brevet start. I greeted old friends and picked up my brevet card at the AJ NishiTokyo reception. A lot of the conversations as we were waiting for the briefing were about the last brevet, the washed-out Fuji 300 km. 57 people who had signed up were sensible enough to not even start. I met two of only 8 finishers out of 23 starters. Fortunately the forecast for BRM512 was much more favourable – no rain, a high of about 27 C and a low of about 13 C.
After the briefing and safety check we were off. I think there were about 70 of us. Before we got out into the countryside, we had to stop for a number of traffic lights. At one of them, the lead cyclist wanted to turn left following the course of the brevet in previous years, while the new course went straight. As I pulled up next to her, I pointed out the three areas where the route had changed from the years before. Perhaps she had not studied the new route in detail. I had sat down in front of two computers with two monitors, comparing the old and the final new route side by side about a week before the ride. I also always make sure to download the route as a GPX file to my GPS so I can follow a breadcrumb trail on its screen, a virtually foolproof way of navigating a course. Despite the length of the course, even out in the countryside I was often within sight of other cyclists, and sometimes drafting or leading someone. That’s always reassuring, as it tells you that your performance is reasonable enough. The organisers had replaced one untimed check on the way to Yamanakako with a timed check point near Kawaguchiko, at about 900 m above sea level. Previously PC1 (point de contrôle 1) had been only after the descent from Motusoku, at much lower elevation again, which allows one to make up time lost climbing from sea level to the elevation of the Fuji Five Lakes. I stopped at one convenience store before entering Doshi road (national route 413) to buy food and some bottled milk tea, then again at the Doshi road station (Michi no Eki Doshi) around km 51. The climb from there to the tunnel felt hard. I was feeling my legs, but I knew the biggest climb would be out of the way and if I could only maintain any time buffer ahead of the required minimum speed that I was left with by then, I could finish the ride by maintaining slightly less than a 15 km/h average, as long as I didn’t get too sleepy. I saw the first Fuji view around Doshi village and was surprised how clear it looked, because there were some clouds in the sky. Nevertheless, on the other side of the pass, the views got even better. On the shore of Yamanakako (Lake Yamanaka) I could see the snow-capped peaks of the Japanese Southern Alps, which is actually fairly rare. Half the time you can’t even see Mt Fuji from the lake that lies right in front of it! It was a gorgeous day for views. From the north side of the lake we followed a minor route, away from national routes 138/139 that we had taken in 2015/2016. The roads were much more quiet. We passed forests and a flower park. Most of it was downhill too. Finally PC1 came up, around km 82. I was 41 minutes ahead of schedule, which was not bad. I bought some food and kept the receipt as proof of the passage. This 7-11 store was right in front of the entrance to a 2.4 km long tunnel. As I was eating and talking to staff and other cyclists, I saw two cyclists in reflective randonneur vests enter the tunnel without stopping for the PC. Later, as I had almost crossed the tunnel, I saw them come back towards the PC inside the tunnel as they must have realized their mistake. After the tunnel the route followed the north shores of Kawaguchiko and Saiko, again offering beautiful Fuji views and opportunities for photographs. Then the road climbed to meet up with Rt139, but only followed it for 6.5 km, with the Aokigahara forest on our side. I was looking forward to the national route 300 turnoff for Motosuko (Lake Motosu). There’s a famous spot facing Mt Fuji where you get the exact same view of it as you see on a 1,000 Japanese yen bank note (well, except for the seasonal amount of snow and the reflection of the mountain on the lake surface depending on how smooth it is with wind, etc). Everybody stopped here to take a picture. Right after that we entered the tunnel for the Motosu road descent, the biggest and fastest descent on the entire course. On a previous event one of the participants had a bad accident here and had to be airlifted to a hospital, so AJ NishiTokyo staff will always point out to be careful on this descent. There are some nice views on this descent too and I stopped again for pictures. After the steepest part we turned off for Yamanashi prefectural route 9, which crosses over to an adjacent valley, then another long descent all the way to PC2 near km 133. After the time gained on the fast descent, I was now 1:25 (85 minutes) ahead of the minimum pace. There were no big climbs on the way to the untimed checkpoint near Minami Alps at km 156, so progress was good. In fact, we even had a nice tailwind. Though this would turn into a headwind on return, the return route also starts with a fair bit of descending that initially more than compensated for the headwind. I passed a TDK factory in Minami Alps that had beautiful rose bushes facing national route 52. The checkpoint on top of a loop-shaped ramp provided a nice view of the wide mountain valley at the heart of Yamanashi prefecture, including Mt Fuji. Though it was still almost another 50 km to the half-way point of the ride, it felt like we were already half way there. There I met my friend Mr O., usually an extremely strong rider, who was resting and looking exhausted. He had not had enough chance to cycle this year to prepare himself. He decided to do the safe thing and retire from the ride. The return route passed through small towns with a nice descent. I could still enjoy the Fuji views from the Minami Alps side, which were as clear as from Yamanakako and Kawaguchiko. Gradually the road became more level and the wind more noticeable, especially after we rejoined Rt52 along the Fujikawa river to the coast. Then we crossed the river near Minobu and followed the Minobu railway line. The road became more hilly and evening approached. There’s a lot of construction going on for the Chūbu-Ōdan Expressway that will connect Chūō Expressway to Shin-Tōmei Expressway when completed. I don’t really like those hills along the Minobu railway, especially after dark when there are no more views, so I was glad when about half an hour after sunset I reached PC3 in Shibakawa (219 km from the start), 2 hours and 14 minutes (134 minutes) ahead of closing time. From here it wasn’t far to the coast and I crossed the river, now heading east towards Numazu. At daytime there would have been more Fuji views, but at night it was just city streets. Every now and then I came across other cyclists who passed me. I was just keeping a steady pace, every now and then yawning or standing up to relieve my bottom, which was starting to complain about the amount of time spent on the bicycle saddle. In Numazu the route turned south into Izu. After Shuzenji it became more rural. I was looking forward to the tunnel at the top of the pass and the descent towards Ito. I made it to PC4, 290 km from the start, a little after midnight, now 2 hours and 15 minutes ahead of closing time. I took a 5 minute nap on a chair inside the convenience store. Others were sleeping too. For the night ride I was wearing long johns under my shorts and also a base layer under my jersey, but no windbreaker which remained unused for the entire ride. It never got cold enough. It felt great to descend to the east Izu coast line and to finally hear the ocean waves. It was still dark and I could admire the many stars above the ocean, since there was a lot less light pollution than in Tokyo. Even after the descent there are four significant climbs between Ito and Odawara, the biggest one being for the road high above Manazuru which lasts for about 4 km. I was feeling safe in the knowledge of having made good time so far. I did yawn every now and then, but the nap had helped. My legs felt OK, not particularly strong but not suffering either and my bottom was OK as long as I made frequent efforts to stand instead of sitting throughout. It was still dark in Odawara but dawn gradually arrived on the ride east to Chigasaki. I saw newspaper motorbikes deliver morning papers and the odd surfer heading to the beach already. Soon after Rt 30 split off the coastal road I saw the 7-11 sign that announced PC5, the final control (367 km from the start). To get my receipt and to use the toilet, I bought a cup of coffee and a sandwich. I had only 36 km left and was 2 hours and 4 minutes ahead of closing time. I basically had 4 1/2 hours to get to Machida. Two years ago, I had been one hour ahead of closing time at PC5 and still made it despite a puncture 16 km from the goal that chewed up most of the time buffer. There were still more Fuji views on the way to Machida. Rain was forecast for the late afternoon and I could see clouds and occasionally feel raindrops, but rain was still a long way off. Sunday morning traffic and traffic lights slowed me down but looking at the remaining distance and time, I figured I had a chance to make the goal by 08:00, a full two hours before goal closing time at 10:00, so I pushed harder. It was not easy after 24 hours on the road, but I tried anyway. I didn’t know if I would make that time until the very end. It was only when I rolled up in front of the Cherubim Bike Shop, greeted by AJ NishiTokyo staff who confirmed 08:00 as my arrival time, that I knew I had completed the course the full two hours under the limit! I parked the bike and got out my brevet card and receipts to have them checked. After signing for the result, I opted for the medal (1,000 yen extra). Then I had some coffee and snacks and chatted with staff members and fellow participants about the course and about bikes. It’s hard for normal people to comprehend how someone can ride 200, 300 or 400 km in a single ride, but each of these rides builds on previous rides in physically and mentally conditioning you for the next challenge. We dare to do more challenging rides only because we successfully rode other, initially also intimidating rides. Any road cyclist who has done 50 km rides can do 100 km rides, and anyone who has done 100 km rides will find 200 km rides within reach. As long as you keep the effort sustainable and keep eating and drinking and ride a bike that fits you, you can keep on going for a very long time. At some point, sleep will become the limiting factor, which then becomes a question of average speed vs. control closing times and your tolerance for sleep deprivation. This 400 km course may actually be becoming my favourite AJ NishiTokyo course, rivaling even the 200 km West Izu (Shiokatsu) course that I also love for its views. 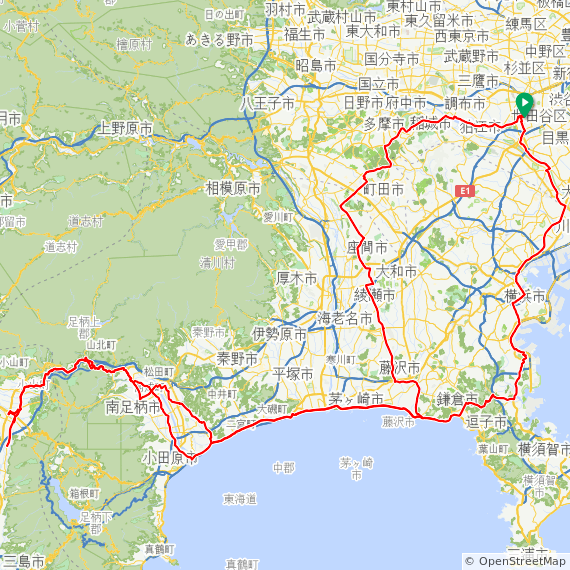 Though it’s longer than the smaller 300 km Fuji ride, I don’t think it’s necessarily any harder. Certainly, in recent years I’ve been able to finish the 400 km with more spare time than in the case of the 300. Perhaps that’s because the effort in the 400 is more concentrated in the first part, when the legs are still fresh, while the 300 saves its biggest climb for halfway into the course. Also, while the 400 has one third more distance than the 300, it only has about one sixth more climbing. This should allow for a higher average speed. I won’t be riding the AJ NishiTokyo 600 km brevet to Lake Suwa and back in early June because I’ll be away on a business trip. So there probably won’t be any brevets for me until September or so. Instead I’ll be just riding with friends again, maybe explore some new routes. Again this year I won’t go for Super Randonneur (SR) status, which involves riding 200, 300, 400 and 600 km distances all in one season. 600 may be beyond reach for me under all but the most favourable conditions, because it’s hard for me to build up enough spare time to sleep enough to keep functioning. Gaining SR status in 2019 is also the qualifying condition for participating in the 1,200 km Paris-Brest-Paris event next August, which I am not currently aiming for. I very much enjoyed my bicycle tour in Italy with my son Shintaro a year ago, where we only covered about 90 km each day, but had nice meals in little restaurants in the countryside. If I were to try more cycling in Europe or elsewhere overseas, this is more like what I would like to try, while keeping up randonneuring as a challenge here in Japan. On Saturday/Sunday I cycled in the 300 km brevet around Mt Fuji organised by AJ NishiTokyo, like in the six previous years. Last year I set a personal best time of 18 hours 51 minutes, which is 1 hour 9 minutes under the 20 hour time limit. This year I was not so hopeful. As the day approached, the weather forecast had turned increasingly worse, finally predicting heavy rain and very strong winds on the course between midnight and about 10:00 on Sunday morning. As it turned out, that forecast was spot on! I had done the 300 km Fuji brevet in the rain once before, in 2014 (see pictures here), but this time turned out far worse. After getting a couple of hours of rest on Saturday afternoon, I cycled 28 km to Machida for the late night start (22:00). In 2014 I had taken the train there and it had already started raining on the way from Machida station to the event starting point. We then had the pre-ride briefing inside the Cherubim bike shop. This year the rain held off until almost 40 km into the brevet, on the way to Enoshima. The crowd at the start was much smaller than usual. As it turned out, most signed-up would-be participants had chosen not to start (DNS) due to the weather conditions. I had cycled to the start in my rain wear, but took it off at a convenience store near the start because I was starting to sweat in it. Four years ago I had worn my Polaris rain jacket, which is even warmer. For fear of overheating I went with a lighter jacket this time. At the briefing we were told about two of the bail-out options, should we chose to retire from the ride. Both Odawara and Gotemba have train stations, but by the time we were to arrive there, the last trains would have left. Nevertheless there would be places around the stations where we could take shelter from the weather until the first morning train. After the bike inspection we set off. It was quite windy, but no rain yet. Up to Enoshima on the coast I rode more by myself than in a group. A couple of km before we reached the coast the first rain drops started falling and it steadily picked up. The first check point was a 7-Eleven store about 2 km east of Enoshima. I got there about 10 minutes to midnight. When I came out of the store again the wind was fierce, whipping up sand off the beach which hit our faces and got on our teeth and into the eyes. The road was narrowed for some roadworks, so being pushed around while cars were passing wasn’t pleasant. I was worried I’d be cycling into a headwind on the way to Odawara, but the wind pattern wasn’t very consistent. Whichever way it shifted though, it did slow us down. Also, there was little chance for riding with others. When I reached PC1 (point de controle) in Odawara, 72 km from the start and 100 km from home for me, it was 40 minutes later than last year. I knew I had to get well ahead of the 15 km/h average that dictates control closing times and the overall time limit while I was on the flat part of the course to make it to PC3 in time, after hours of climbing on the west side of Mt Fuji later in the day. After Odawara I put on my do-it-yourself shoe covers, fashioned out of some plastic bags and tape, to keep my shoes and socks dry. Nevertheless, as I started climbing up to Gotemba, which sits on a saddle between the Fuji and Hakone volcanoes, gradually I was getting soaked more and more. My long sleeve jersey and my uniqlo long johns were absorbing cold rain that leaked through the rain gear. I think my Polaris rain jacket would have done a much better job at keeping me dry. I cycled with another participant for the middle part of the climb, but then stopped at a convenience store for food and a toilet break. My eyes started getting irritated. Either the rain was washing sweat into my eyes, or it was sand stuck to my face since Enoshima that got washed into my eyes. Taking off my glasses and wiping my eyes with the back of my gloves or the fingers didn’t help much. The climb leveled off near Gotemba but the wind and rain were still picking up in intensity. At this wind speed the rain drops felt like pin pricks to the skin. At dawn the atrocious weather and the near absence of people gave the scenery an almost apocalyptic feel. From here it was about 25 km downhill to Numazu, but with no prospect of the weather improving soon. This was perhaps the coldest part of the course due to of the combination of rain, early morning hours and wind chill while descending. I was already shivering with cold while alternating between closing my left and my right eye to avoid the burning feeling. Checking my notes, I was now running about an hour behind my 2017 times. The lack of a time buffer already made it questionable if I could make it to PC3 in time even if I could make it to PC2 OK. On this course my time buffer usually decreases significantly from PC2 to PC3 due to the time loss on the long west Fuji climb. More importantly, the combination of eye trouble, hypothermia symptoms and the strong wind made me think about the risks of continuing. Even if I could coast down to Numazu, if I had to abandon the ride after that I would have to climb back up to Gotemba to get back home or ride the full course. That’s when I, remembering the advice at the pre-ride briefing, decided to find shelter from the storm in Gotemba and to head back to Odawara once things had improved. Two or three other cyclists passed after I turned around and I shouted out to one of them that I was retiring. I found a McDonald’s on Google Maps that was open 24h and not too far away. I locked up my bike outside and walked in with my front bag. I bought myself some breakfast with coffee and sat down in a corner. I could take off my rain jacket to let my jersey dry. After eating I took a nap. When I woke up again it was still raining hard. Around 08:00 I called the organizers and let them know I was retiring from the event and would cycle home by myself. An hour later it looked like the rain had eased a bit. I cleared my table and headed outside again. It got warmer as I descended towards Odawara. I took pictures of the muddy, swollen rivers I passed. After about another hour the rain stopped. The black and grey rain clouds against the sunlight at the coast were beautiful. I joined the coastal road and headed east, past Enoshima to Kamakura. There I crossed the mountains over to the Tokyo bay side of Miura peninsula, then up to Yokohama and Kawasaki. I got home about 24 hours after I had set off, with 283 km of cycling. I hadn’t caught a single glimpse (let alone taken a picture) of Mt Fuji, but I was glad to be home safely. This definitely wasn’t the most fun bike ride I have done, but unlike other difficult rides I have done, I also didn’t get much of a feeling of achievement out of it — the first time in 7 years that I didn’t complete the Fuji loop. Perhaps this is one time I should have decided to stay home when I saw the consistently bad weather forecasts. It would have been the rational thing to do. But for me, long distance cycling is not that rational a thing to do. Much of it is a mental challenge as much as a physical one. I do long rides because I love the views, but partly I also do long rides so I won’t be afraid of doing long rides. They can be intimidating. I can take on bigger challenges only because I have faced smaller challenges before. You overcome fear of being stranded in a strange place by venturing out there and facing the challenges. Sometimes I learn something about myself from the experiences. It can be a balancing act. I am never 100% committed to achieving my immediate goal, because there are more important objectives. To be able to continue doing long rides, I can’t get seriously injured or worse, so I need to decide what risks to take and when to cut my losses. A week from now I’ll be riding BRM414 NishiTokyo 300km Fuji (BRM414西東京300km富士), a 300 km clockwise loop around Mt Fuji from Machida to Machida (Sat, 22:00 -> Sun, 18:00). In May 2012 this course was my introduction to randonneuring and I’ll be riding it for the 7th consecutive year. This year the course has been updated in a couple of places. The checkpoint at Enoshima has moved from the public toilets near Katase-Enoshima station to a 7-11 further east. PC1 in Odawara has also been moved to a 7-11 with better toilets. PC2 in Shibakawa is in the same place, but has switched from being a Circle K to a Familymart. Around Kawaguchiko-Fujiyoshida the route has been moved from N139 to smaller roads nearer to the lake, avoiding some of the notoriously rough road surfaces there. The rest of the route is the same as last year. The 22:00 start followed by 7 hours of riding through the night makes it essential to get plenty of sleep before the start. I’ll take a good nap in the afternoon before I ride 28 km to the start. Some rain is forecast for Saturday. Hopefully the ride itself will be dry, but I have once done this course with it raining for the first 150 km, which is not much fun (and it’s a pity if Mt Fuji is obscured by rain clouds). This weekend I will be riding another century distance (160.9 km or more) as my last preparation ride before the event. This should make April my 68th consecutive month with at least one century ride. By the end of this year I will have cycled just over 8,000 km, slightly less than in the last couple of years (I cycled about 9,000 km in 2013, 2014 and 2016 and topped 10,000 km in 2015). At the same time, the number of century rides (rides of at least 160.9 km aka 100 miles in one day) has actually gone up. In 2012, my first season of century rides, I completed 11 of them. Both in 2013 and 2014 I rode 21. The next two years I managed 22 each. This year, with one week left to the end of the year, the total came to 27 centuries. The biggest difference has been that I didn’t participate in any 400 or 600 km brevets this year due to my business travel schedule. Both in 2015 and 2016 I had signed up for one 400 km brevet (which I finished) and one 600 km (which I DNF’ed). Both years I also pre-rode the 400 km route on a personal long distance ride. So I missed some distance overall, but most months I managed to ride 2 or 3 centuries. It’s all about being consistent. With my December rides I have extended my “A Century A Month” streak to 5 years and 4 months. To ensure that I can keep this up, I usually do a long ride on the first weekend of each calendar month. That way, if anything comes up later in the month, such as a typhoon hitting Japan or me having to travel abroad, I won’t have an issue. I have been very pleased with my Elephant Bikes National Forest Explorer. Last year I converted it to 11 speed with a Sugino “compact plus” double crank and hydraulic brakes. It has been fun to ride and extremely reliable. The ride comfort from the 42 mm Compass tires is terrific and I have been without puncture for 20 months now. I still ride my Bike Friday Pocket Rocket as well and had its rear converted to a disc brake a couple of months ago. The main attraction of long rides to me is the views I come across, at all times of day, in all kinds of weather and in all four seasons. I ride to see things, by myself or with friends. June: Doshi village for coffee and cresson cake. July: Some hydrangea blossoms at a mountain ride in Hinohara with friends. Eight years ago I visited Yakushima island near Kyushu/Japan with my family. We did a lot of hiking to see the ancient Cryptomeria trees in the lush green mountains, but we did not try to go to Jōmon Sugi (縄文杉), the oldest and biggest tree on the island. It is estimated to be around 2000-7000 years old. Visiting it involves an all day hike. At the time I thought it was a bit far for my kids to hike. Most people take a bus to the Anbo trail. Starting from the Arakawa trail head they walk along the tracks of the old narrow gauge railway previously used for logging. From there they follow the Okabu trail, which consists of a combination of dirt tracks, wooden steps and board walks. The route passes by Wilson’s Stump, the hollow remains of an even bigger tree, the size of a small living room. The round trip on this route takes about 9-10 hours. People often leave their hotels at 04:00 to catch the first bus to the trail head at 05:00. The last return bus from the trail head leaves at 18:00. Looking at the map (PDF here), I saw that one could avoid the buses by starting at Shiratani Unsuiko, climbing over the Tsuji Toge Pass and joining the Anbo trail about halfway to the turnoff for the Wilson stump. It involves a lot more climbing and descending, but the up side is that one is not tied to the bus schedule, no need for bus tickets and last but not least, Shiratani Unsuikyo is one of the most beautiful parts of the island. Furthermore, not far from Tsuji Toge Pass lies Taiko Iwa, a rock overlooking a mountainous valley with spectacular views. We left the hotel in Miyanoura at 06:30. The hotel had prepared two lunch boxes for each of us, one with breakfast that we had in our room and one with lunch for during the hike. After driving up the steep road to Shiratani Unsuikyo high in the mountains, we parked the car in the car park and started to hike. It was hot and humid but at least we were mostly walking in the shade of the dense forest. At the Shiratani mountain hut I filled up with water. From the pass we climbed the trail up to Taiko Iwa. It was at least half an hour of detour, but we spent quite a bit more on taking pictures at the top. A tour guide we met there told us we were probably a bit too late already to still make it to Jōmon Sugi in time to be back at the car park by the evening. Still, we decided to push on and see by what time we could make it to the Wilson stump. I reckoned, if we could make it there by noon we’d be at Jōmon Sugi by 13:00 and back at Shiratani Unsuikyo by 18:00, with about an hour spare before it got dark this time of the year. Personally I find descents on foot harder than climbs, because they exercise muscles that only get used going downhill whereas climbing is much more similar to the kind of cardio exercise I get from cycling that I’m used to. After about half an hour of descent we reached the old railway tracks, with wooden planks in the middle that made it easy to walk fast. After maybe an hour we reached the turn-off for the Wilson stump. From here the course was a lot harder again. Especially the stairs were very hard on the legs. We encountered some people heading back already. Many groups of people were resting by the side of the trail, either already return from or still heading to the tree. There are two large viewing platforms near the tree, one below it on the hillside, one above it. For protection you can’t approach the tree itself anymore. It was still a little before 13:00 when we started the hike back. With about six hours until sunset I was pretty sure we would make it, but it was going to be hard. There was a lot of up and down back to the Wilson stump and the Anbo trail. We rested a while at the Wilson stump, after going inside and taking pictures (there were about 8 people inside the stump at the time). We were totally drenched in sweat by then. I had brought a towel to wipe my sweat but it was already soaking wet. All my clothes were soaked through. Paper tickets in my backpack dissolved. I slowed down on the Anbo trail. With the goal of making it to the tree before cut-off time gone, I just wanted to make it to the end with the least amount of pain. We rested again at the public toilets before the climb back up to the pass. Again I found the climb easier than the descent because my wife and kids slowed down more climbing while I had fallen behind on the descent. The last kilometers from the Tsuji Toge Pass down to the Shiratani Unsuikyo car park were the hardest. All my muscles were sore. A few hundred meters before the goal we soaked our feet in the cool water. Finally we made it to the car, well before 18:00. On the way down to the coast we passed some Yakushima monkeys. There are many of them all over the island, but especially on the mountains and on the west coast. My legs were sore for several days after the hike (probably not helped by a canyoning tour the very next morning, which by itself was a lot of fun). It was a great adventure to combine Jōmon Sugi with Shiratani Unsuikyo and Taiko Iwa. The latter two are definitely a local highlight, and much more interesting than Jōmon Sugi, which even though it’s impressive, is no match for the variety of stunning views at Shiratani Unsuikyo. One of the hotel staff, who was a keen hiker, told us that even though he had also done the combined route, he had only ever done it once because it’s so hard. I can understand that. If you want to see Jōmon Sugi, the conventional route on the Anbo trail is much easier, but then you should definitely also go and see Shiratani Unsuikyo separately. When I next visit Yakushima, I probably won’t be hiking to Jōmon Sugi again, but I would love to visit Shiratani Unsuikyo again, perhaps climbing up from the coast by bicycle. A bicycle loop of the entire coastal road around the island (ca. 130 km) is also on my agenda for a future trip.